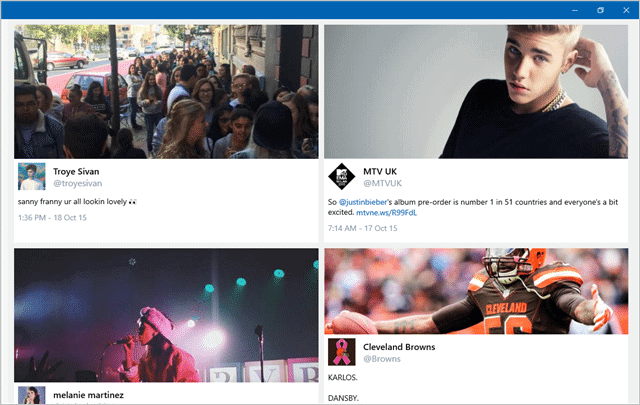 Twitter now has a dedicated app in Windows 10. As Microsoft continues to push the Windows Store as a viable way to get apps to run in Windows 8 and 10, it’s no surprise with the adoption rate of Windows 10 while companies are starting to pay attention. 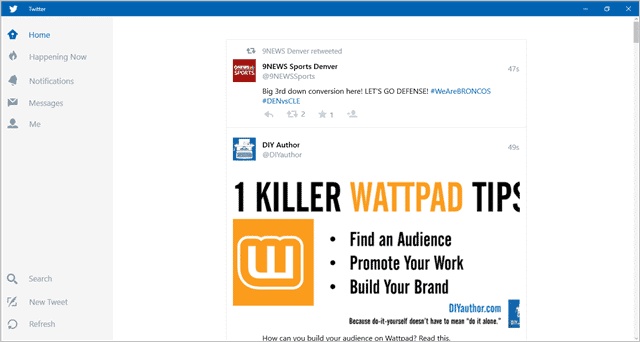 Twitter is the latest big name to introduce a dedicated app in Windows 10. Let’s look at the Twitter app for Windows 10 and whether or not it’s worth your time to use on your PC. The Twitter app can be found in the Store with a simple search for “Twitter.” It’s free for users, which is always a plus. The app currently has a 3.7 star rating out of 12,605 ratings as of 10/15/2015, which is pretty good for a Store app from a big name. Here’s the direct link to the Twitter app in the Store. This will open the Store app in Windows 10. You’ll find all the big name features in the Twitter app for Windows 10, along with the ability to use the new group messaging feature and switching between accounts seamlessly. 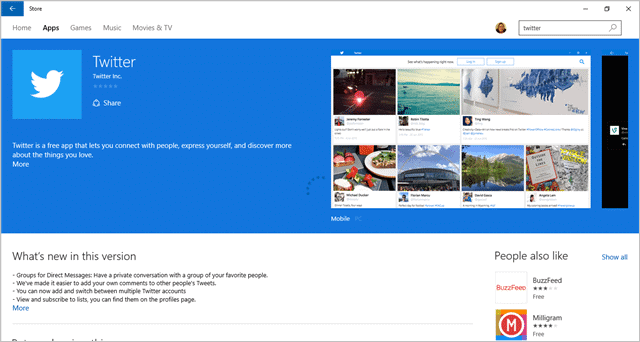 Once installed, you’ll be greeted by what’s trending on Twitter before logging in. Once logged in, you’ll find a minimalistic approach to Twitter in Windows 10. This is an emerging theme in apps on the Store since the Windows 10 launch. In the left-hand column, you’ll find the familiar aspects of Twitter, such as notifications, messages, and search. You can refresh the app at any time by clicking “Refresh” at the bottom left-hand corner of the screen. In the middle, you’ll find your primary timeline. You’re greeted with full pictures as opposed to thumbnails like using the web app for Twitter. You can adjust the size of the app and snap it as you see fit. When you reply to a tweet, it’ll open on the right-hand side for you to see the original tweet. In full-screen mode, this takes up way too much white space which just makes the app look so small. You can edit your profile from the app just like you would on the web. 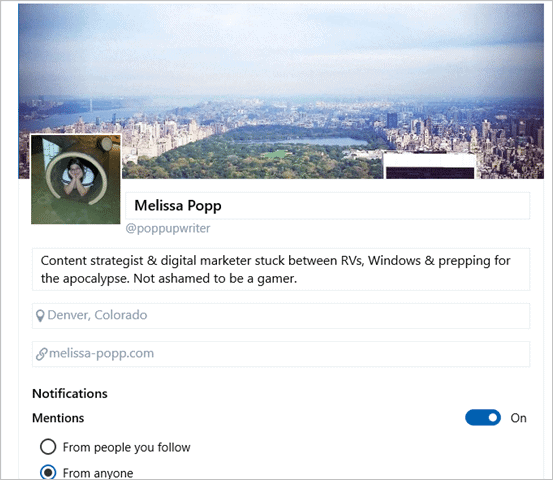 The new Happening Now feature is also alive and well – despite user’s protests – in the Windows 10 Twitter app. Search, so far, is lightning fast with the Twitter app and sees more responsive than searching online for a hashtag, user, etc. Overall, the Twitter app is a nice addition to Windows 10 coming from Twitter themselves. The app still needs a lot of work to make it more visually appealing and customizable for users looking to power use Twitter. If you’re looking for an easy way to manage a single Twitter account, the Twitter app in Windows 10 can do just that but not much more, yet.